November 2017 - Perry Hood Properties, Inc.
With Santa just a few days away from coming down your chimney, you’re likely filling out your list and looking at all the latest and greatest gadgets that might suit your fancy. If you browse long enough, there’s a good chance you’ll come across a few home automation products. These products can turn your home into something straight out of a science fiction novel by letting you control almost everything from your phone. Here are a few ways you can live like the Jetsons with a fully automated home. How many times have you forgotten to turn the light off when you leave the house? This bad habit wastes energy and costs you money, but you can easily kick this habit with technology. Buying smart light bulbs from Philips will let you control your lights from anywhere with a Wi-Fi connection. Almost every modern home security provider will offer the ability to arm and disarm your alarm system remotely. This feature lets you arm your system when you forgot, and gives you the ability to let neighbors or friends in without sounding the alarm. Some of the fancier alarm systems will even come with door locks that can be controlled remotely as well. There’s no need to heat or cool your home when you’re not there. With a Wi-Fi thermostat, like Nest, you can adjust your thermostat on the go and stop wasting money on unneeded energy. These thermostats can also be programmed to automatically raise and lower the temperature based on when you’re regularly in and out of the house. You can go with an a la carte option and get just one or two of the above-mentioned items, or you can centralize all your home automation devices with one app. This gives you the ability to control everything in your home from one place. These systems are a bit more pricey than the a la carte options, but it is much more convenient. Once you’ve made the decision to build a new home, you’ll need to set up a new home site tour. With Perry Hood Properties, setting this tour up can be done over the phone, by email, or online. After we’ve made the necessary arrangements, we’ll put on our walking shoes and show you all the great homes and floorplans we have to offer. A typical tour will last around an hour, but the timeframe is totally up to you. If you know exactly what you want to see and are fairly decisive, we can knock it out in a flash. But if you like seeing all your options and want a little time to mull things over, we’re happy to spend as much time as you need. Regardless of your timeframe, most new home site tours will include some combination of the following. The goal of a new home site tour is for you to see all the options you have available with Perry Hood Properties. From there, if you like what you see, we can move into the contract phase and start building your new dream home. During this tour, you’re more than welcome to bring your real estate agent along with you, but you don’t have to. Over our 30 years in business, we’ve worked with plenty of real estate agents in the Tulsa area, but we can also work directly with home buyers as well. We’re happy to accommodate whatever situation you’re most comfortable with. If you’re in the market for new construction homes in Tulsa, give us a call and we’ll be happy to set up a new home site tour for you. As winter settles in the tissue boxes and allergy medications are flying off the shelves at local drug stores. The changing of the seasons inevitably comes with a fresh round of allergies sweeping across the plains. Some of these allergies are unavoidable, but allergies in the home can be avoided with a few simple steps. As with any battle against evil forces, knowledge is power. There are four primary sources of indoor allergies and they all have cyclical patterns when they peak and cause the most trouble. By knowing when each source is about to hit, you can take the necessary steps to stop the sneezing. Here are the main culprits and when they peak. Most people only dust or sweep when there’s a visible mess to deal with. However, weekly dusting and sweeping will eliminate those agitators you can’t see before they cause any problems. Just because you can’t see the dust on the window seal doesn’t mean there’s no dust there. Keeping a stack of magazines or newspapers on the coffee table or in the bathroom is a common practice in many homes. However, these stacks of paper can be a sought-after oasis for roaches and even mice. Make sure you periodically cycle through these periodicals so the critters know they aren’t welcome. One of the best ways to cut down on home allergies is to splurge on good air filters, and change them every three months. The basic air filters will only filter out a few allergens, but the top shelf filters will help you breathe easy all year long. Ever since the Jetsons and Flash Gordon showed us what living in the future might look like, we’ve been working hard to integrate tech into our lives. Having a smartphone in every pocket makes this dream more of a reality, and phones aren’t the only thing getting smarter. It seems like there’s a new piece of technology invented every day with the express purpose of making our homes smarter. 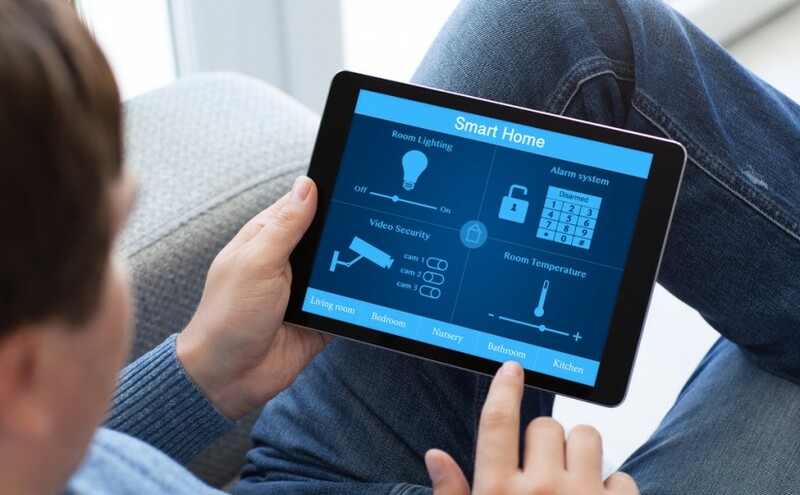 Investing in smart home technology will not only make your life easier, it can also increase the value of your home when it comes time to sell. 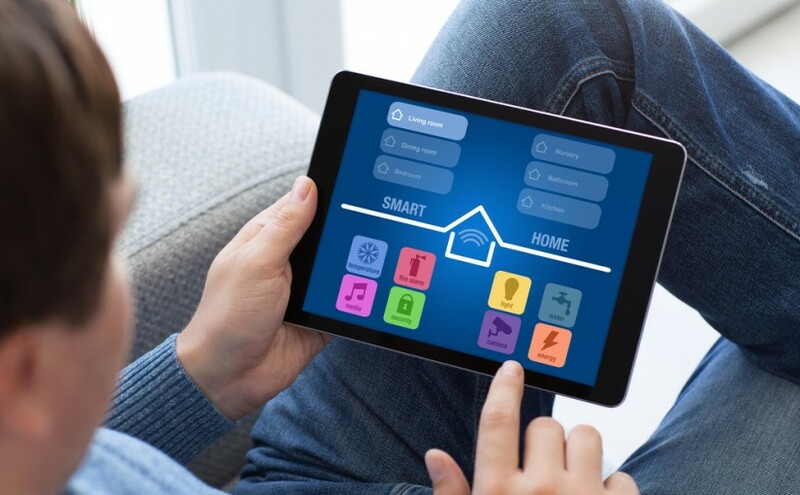 Buyers love walking into a tech-savvy home, and here are four ways you can use technology to raise the value of your home. If you’re looking for a fast way to unnecessarily skyrocket your utility bill, look no further than your thermostat. Most people have no idea how much money they’re wasting by not adjusting the thermostat when they leave the house for work or vacation. By upgrading to a programmable thermostat, you can set the thermostat to take it easy when you’re away. If you really want to be fancy, go for one with Wi-Fi connectivity so you can adjust and program the temperature straight from your smartphone. How many times have you had to remind your kids to turn the lights off when they leave the room? It may sound like a minor problem, but leaving the lights on will burn through bulbs and raise your electricity bill. The solution is smart lights that can be turned off and even dimmed with your smartphone no matter where you are. Home security systems have made leaps and bounds in the way of technological advancements. What used to be just a few door and window sensors has evolved into video cameras, motion activated lights, doorbell intercoms, and keypad activated locks. The best part, all of this can be controlled from your phone. Using your smartphone to control your home is nice, but sometimes your hands are busy doing other things so your phone isn’t an option. Thankfully, there are options that use voice commands to control your homes. Amazon Echo and Google Home can both integrate with different smart home features, so you can keep control and be hands-free.